There’s so much to talk about the new M2 it was hard to know where to stop in writing our recent review. So instead of going deep into details in our general review, we thought we’d separate some of the technical talk into something different. And by different we mean the most thorough technical look possible. 4300 words and an enormous amount of detailed engineering diagrams that will give you the best look yet of what went into the making of the 2016 BMW M2. 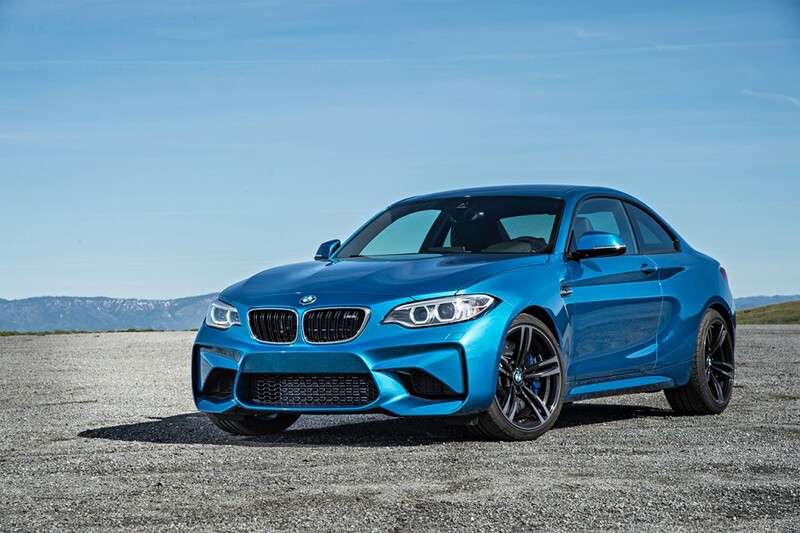 First off, let’s take a broad look at how the F87 M2 compares to the F22 M235i and the current M3 the F80. 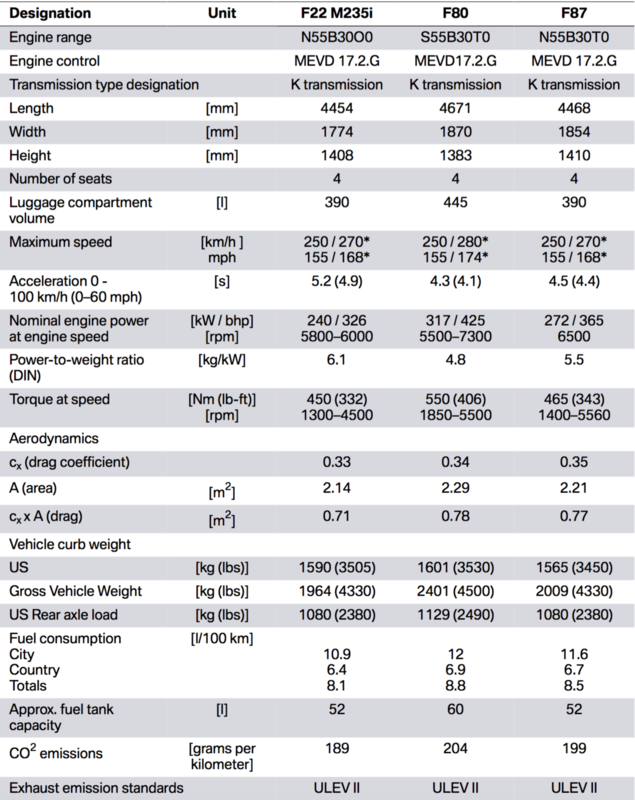 It’s worth noting that these weight figures differ slightly from what we’ve seen published elsewhere by BMW. But the one thing that remains consistent is that the M2 doesn’t quite achieve the weight savings that the 1M had nor what the M3/M4 currently achieve. One small note that points to a longer gestation period, the M2 has an increased gas tank over the M235i. The 1M was saddled with the same sized tank as all other 1 Series, meaning it has woeful range tank to tank. It’s nice to see that longer engineering cycle show up in these type of details. Now onto the details that make the M2 an M car. 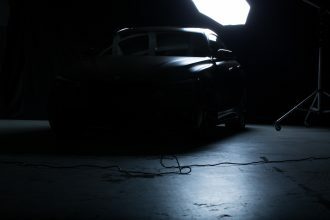 Let’s first look at the suspension and the various ways that M modified the F22 and turned it into the F87 M2. One of the more dramatic areas of change for the M2 over the M235i is the suspension. And of that it’s the front that is radically altered. 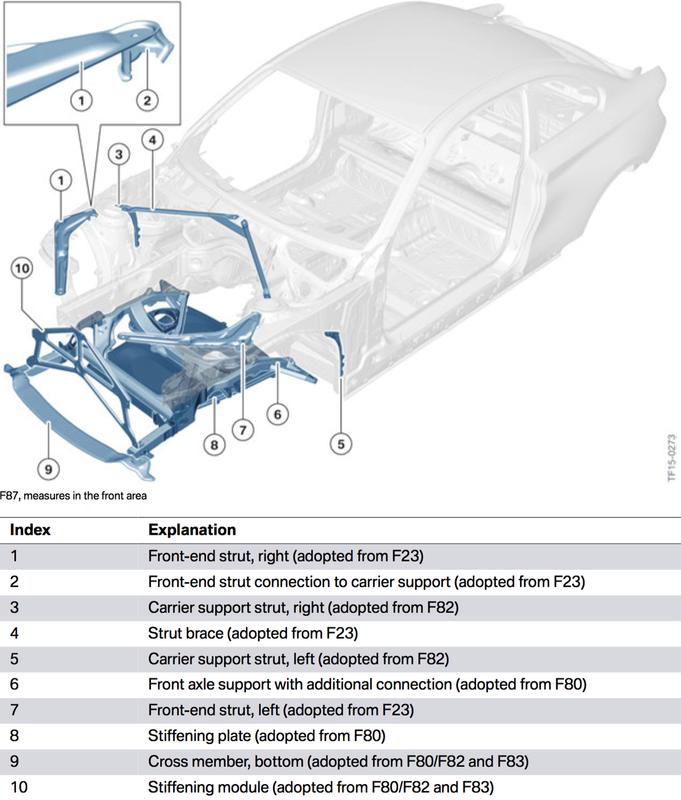 The body of the M2 is altered in a couple of key ways over the F22. Up front the fenders are made of aluminum to save weight (and to better distribute it). Other altered parts from the M235i include the Wheel arch cover and side frame on the left and right and the inner C-pillars. Then there are those lovely hips. Again all new and stretched substantially over the F22 to house all those M4 derived components. Elsewhere underneath M focused on underbody paneling for thermal cooling and aero purposes. The underbody is fully paneled partially to reduce and uniformly distribute the lift at the front and rear axles. This helps to increase stability at high speed (as I found out on the front stretch of Laguna Seca). Inside M engineers focused on not just making the M2 look unique but also weight savings. Various insulation materials were eliminated, saving 24 lbs compared with the F22 235i. Even the steering wheel was subtly downsized thanks to the use of the F80/F82’s wheel. 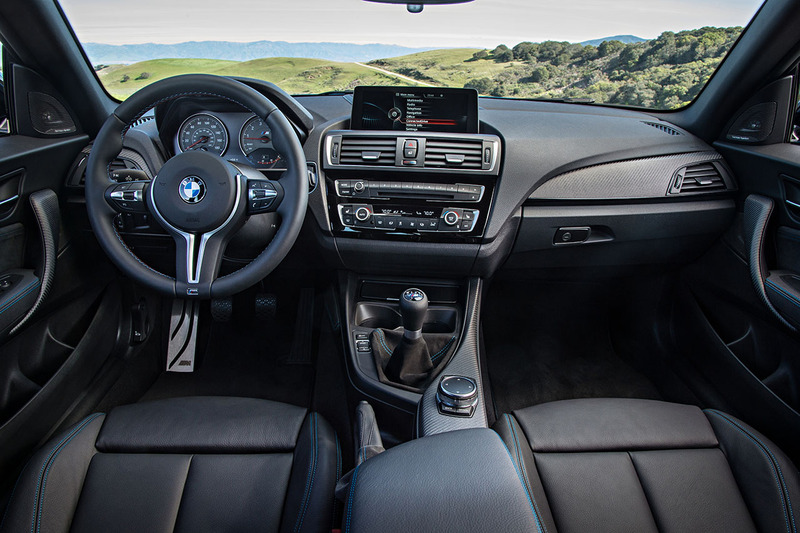 The M leather steering wheel has a magnesium frame and a radial diameter 8 mm smaller than the one on the M235i. The outer diameter was also reduced by 2 mm. The steering wheel rim is reinforced to 31.6 mm in comparison to the standard version. 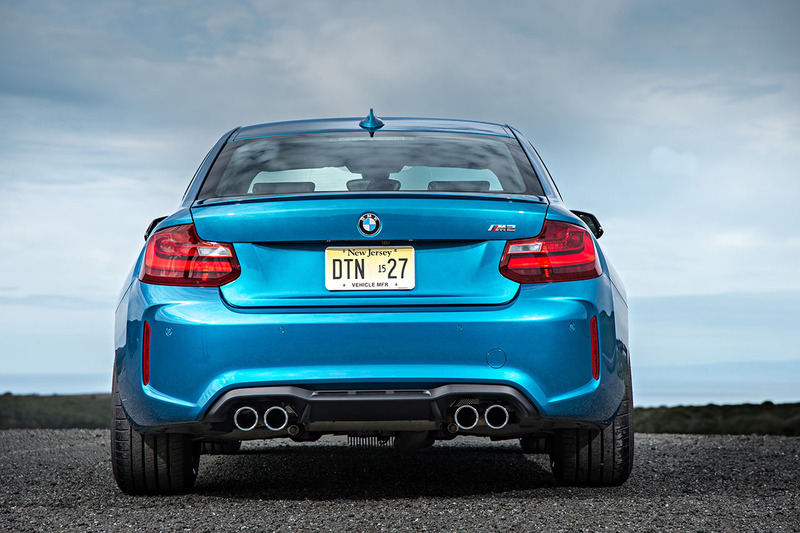 The BMW M2 is powered by the N55B30T0 and has a output of 365 HP and 343 ft lbs of torque. 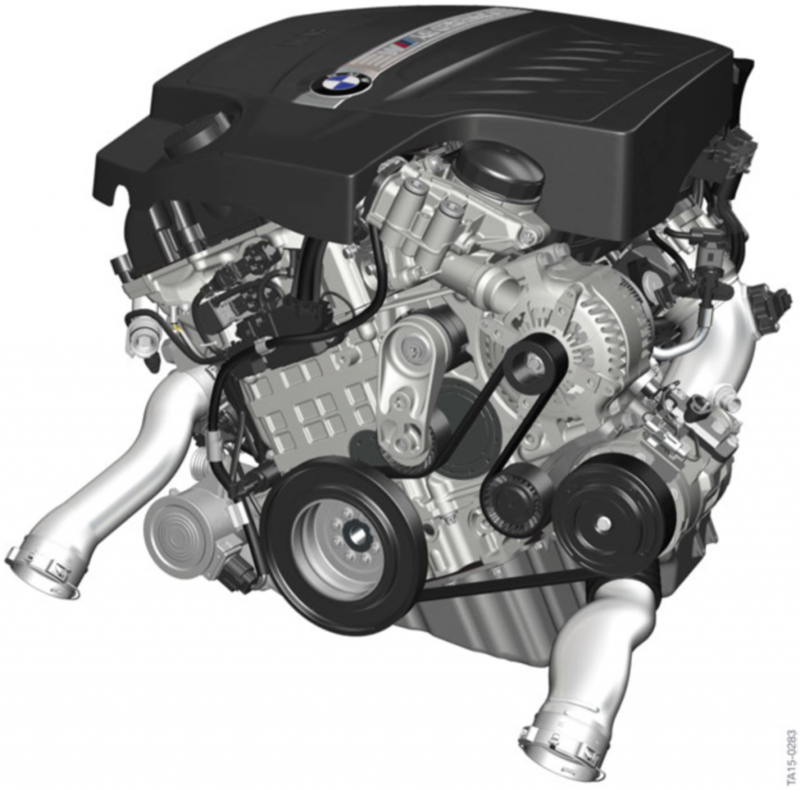 This revision of the N55 is an iteration on the N55B30O0 engine from the BMW M135i and BMW M235i. There’s quite a lot that has been altered in the N55 that’s also in the M2, so it’s hard to know where to start. So let’s begin where the engine gets its start. The air intake system has been subtly altered with a new intake silencer housing. On the N55B30T0 an additional opening is designed into the bottom housing to optimize the power and for dethrottling purposes. The crankshaft bearing shells have been taken straight from the M3/M4’s S55. The main changes are in the three-material S703C electroplated bearing used as a material combination for the lower bearing shells. For the upper bearing shells a two-material bearing made from aluminium R25 is used. Oil supply is another area that M engineers spent time addressing. The oil sump of the N55B30T0 engine is a common part from the M3/M4’s S55 engine and is made of aluminium. Interestingly the oil sump on the 2015 model year cars included a oil sump made from magnesium that allowed for a weight savings of 2.2 lbs. 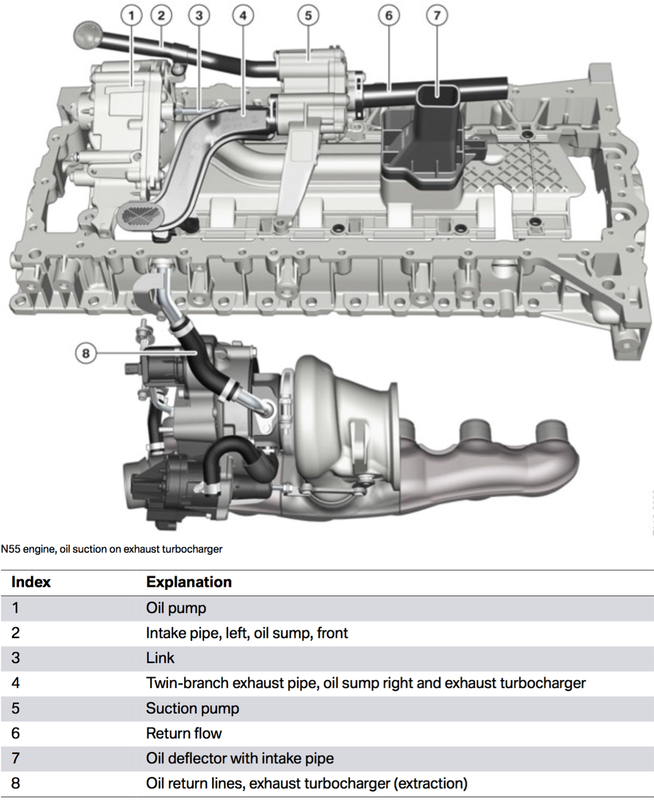 However sometime within the last year BMW quietly changed the oil sump to aluminum, negating the weight savings and likely preserving some money in the process. That aluminum version is what the M2 now has. With these changes the oil supply can be guaranteed up to a longitudinal acceleration of 0.61 g. This can even be achieved up to – 1.2 g in the case of deceleration. 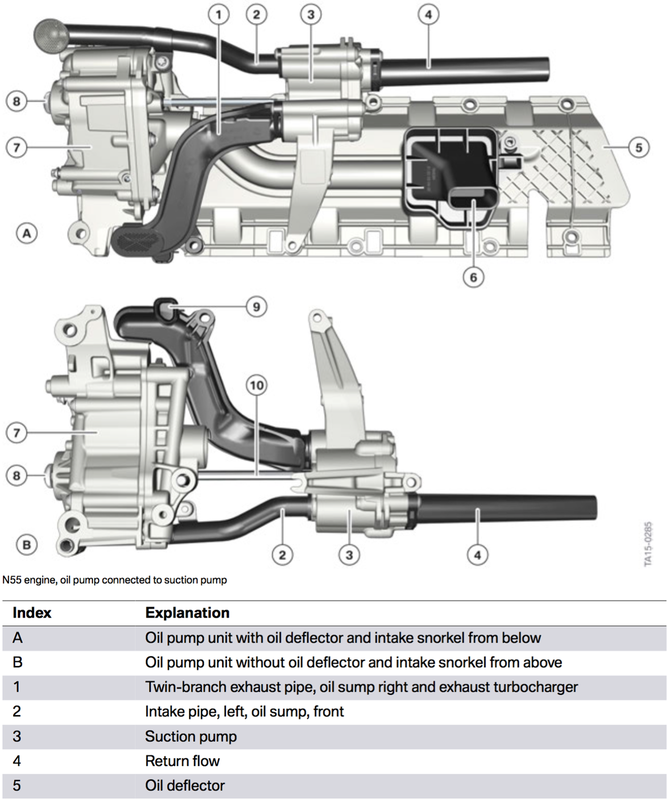 Also with lateral acceleration (cornering) this structure enables a secure oil supply up to constant 1.2 g.
Due to track requirements BMWM has also installed a secondary oil pump known as the suction pump. This new pump helps increase oil flow by enhancing the return flow of the oil from the exhaust turbocharger and from the front areas of the oil sump back to the rear area of the oil sump. In extreme situations such as track driving, the engine oil is drawn by the suction pump through the suction pipes (2/4) from the front part of the oil sump during longitudinal acceleration, or from the side parts of the oil sump during lateral acceleration. The oil drawn in is delivered via the return flow (6) back to the rear part of the oil sump. There the oil pump can re-absorb the oil via the oil deflector with intake pipe (7) and deliver it to the engine lubrication points. The suction pump is a twin-flow gear pump. The outer chambers of the gear pump serve as suction chambers. 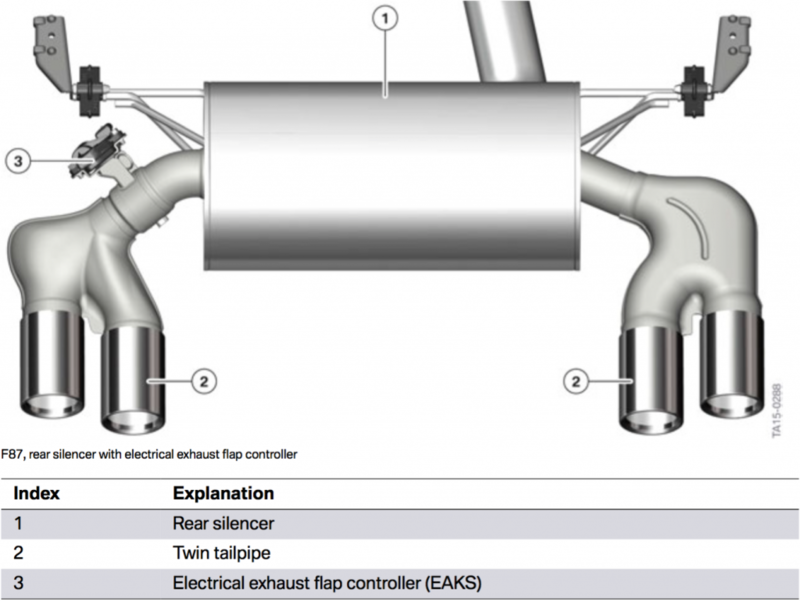 In addition to the suction pipes in the front oil sump, the suction pipe in combination with the oil return line for the exhaust turbocharger is also connected at the suction chambers. 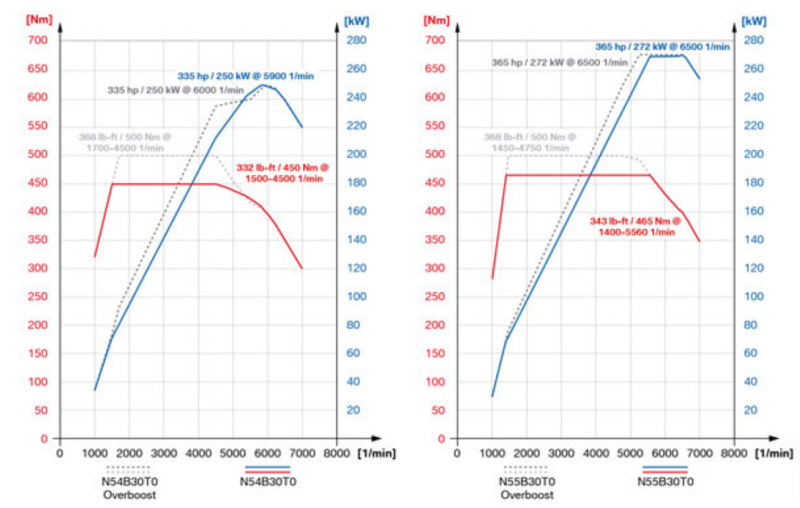 On the M2’s N55B30T0 engine, BMWM are employing the same method of overboost used on the 1M. Within the overboost function torque is increased from 465 Nm/343 lb-ft to 500 Nm/369 lb-ft by a brief increase in the charging pressure of 0.1 bar above the normal charging pressure. Interestingly the N55B30T0’s blow-off valve is taken from the four cylinder N20 engine. After our drive on the track and around Monterey I can confirm that the sound of the exhaust is both more aggressive and full sounding than the M235i. The exhaust flap is closed at idle, in the lower speed range and nearly of the time when the car’s in COMFORT mode (the exception being under heavy load). In SPORT and SPORT+ positions, the exhaust flap is fully open when the engine is idling while the vehicle is stationary and in the lower gears. Interestingly in the the higher gears, the exhaust flap is closed in the critical ranges. The same applies in the upper engine speed ranges depending on the load. With the modern high output turbocharged engine cooling is critical because BMWM have opted for an additional engine oil-air heat exchanger at the front right. 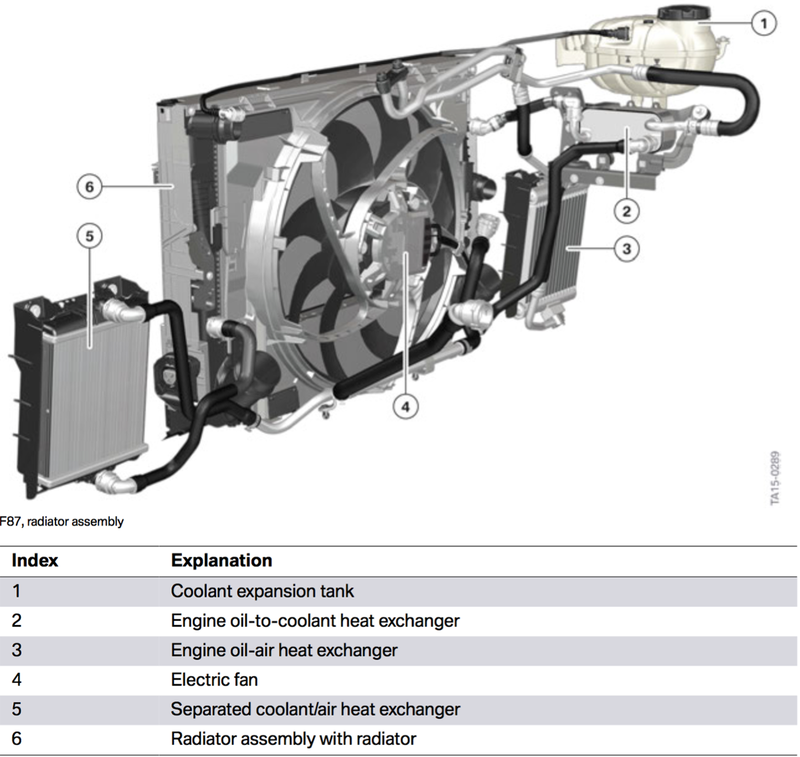 An engine oil-coolant heat exchanger is installed under the coolant expansion tank supported by a 850 W electric fan. An additional electrical 50 W coolant pump circulates the coolant from the external coolant-air heat exchanger via the engine oil-coolant heat exchanger back to the radiator. It’s a mouthful but it did the trick on a warm day at Laguna Seca where we had the M2 on the track for 8 hours on and off. 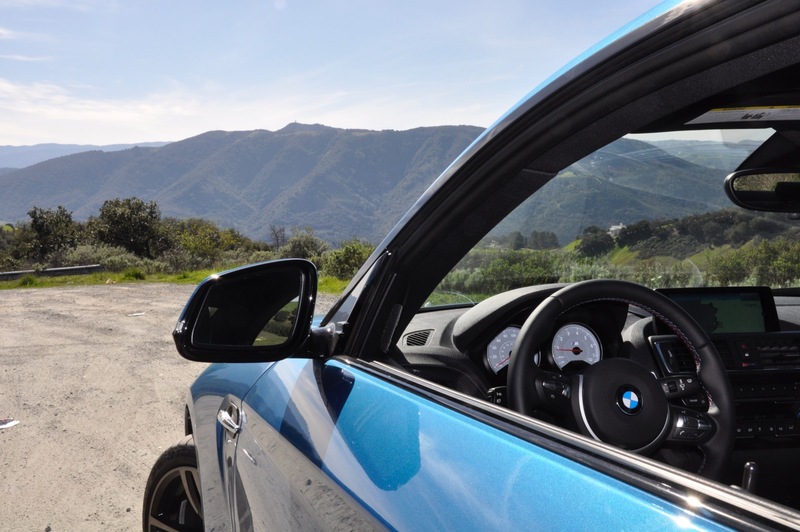 All other parts of the cooling system are identical to the M235i’s N55B30O0 engine. The M2 uses the same spark plug as found in the M3 and M4’s S55 engine. The ignition wiring harness was also adopted from the S55 engine. All other components in the area of the engine electrical system of the N55B30T0 engine are identical to those of the N55B30O0 engine. 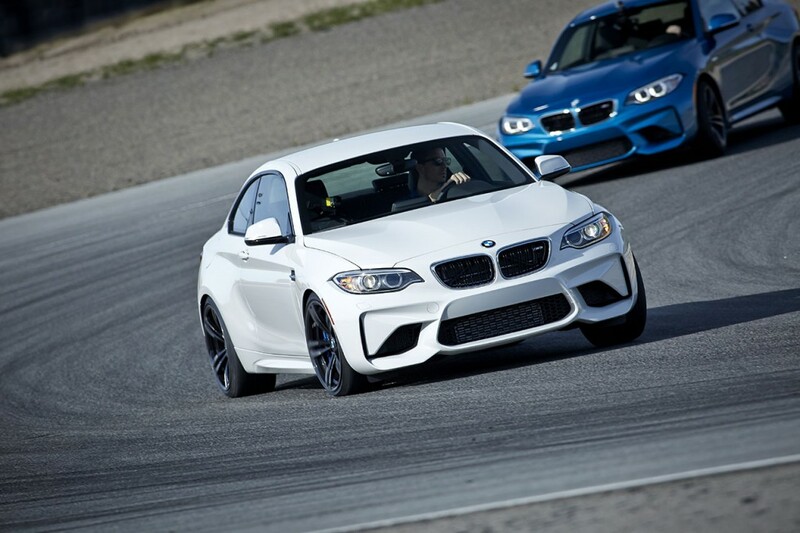 Engine speed adaptation (aka rev matching) is standard with the manual gearbox used in F87 BMW M2. Some will look at this as a further computerization of the driving experience. While it’s true it does make it easier to drive the manual M2 with more finesse, it also allows more focus on the track and a bit more theatre. Granted you don’t get the satisfaction of the heel-to-toe but it’s rather addicting given the M2’s aggressive exhaust. 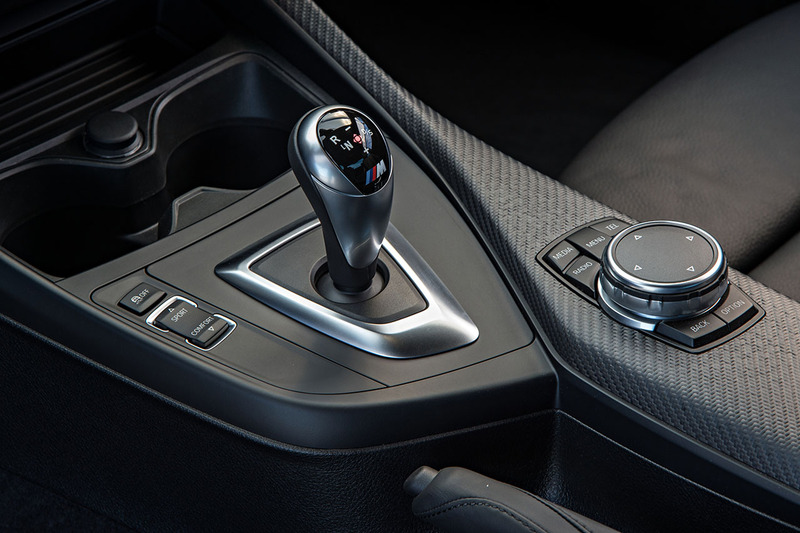 The gearshift lever and gearshift fork used in the F87 BMW M2 are identical with the parts from the F80, F82 and F83 with manual gearbox. 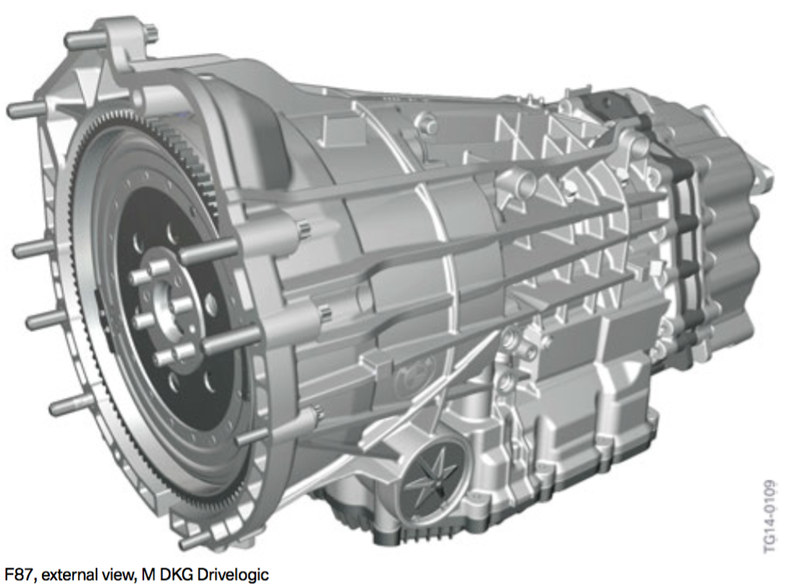 In addition, a double-disc clutch in combination with a dual-mass flywheel is used for the manual gearbox. The operating principle of the clutch is identical to the double-disc clutch systems already used. The GS7D36BG M DKG with Drivelogic is one of the M2’s only options. 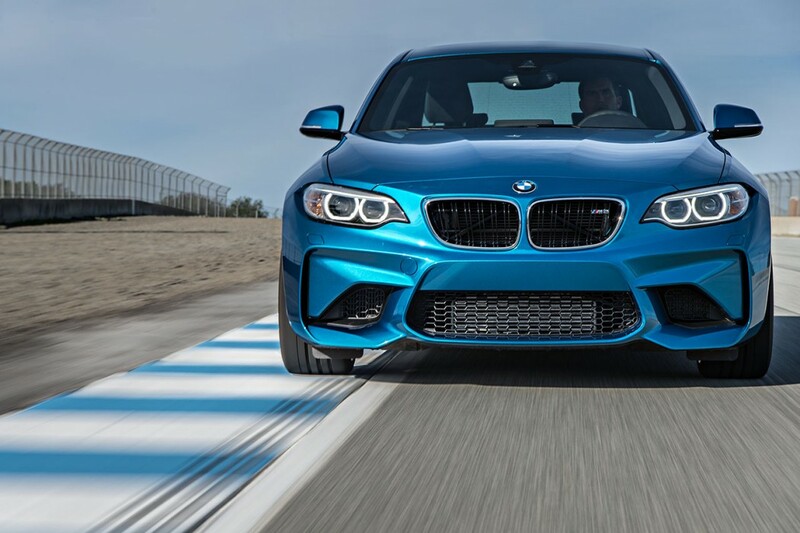 The double-clutch transmission used in the new F87 BMW M2 is technically identical to the double-clutch transmission in the F80, F82 and F83. The M double-clutch transmission with Drivelogic (GS7D36SG) was used for the first time in the E9X BMW M3 with the wonderful S65B40 V8 engine. The Drivelogic system matched to the M double-clutch transmission provides different driving programs based on COMFORT/SPORT and SPORT+. In automatic D mode with the driving experience switch in COMFORT position, upshifts and downshifts take place early and with reduced shift intensity. 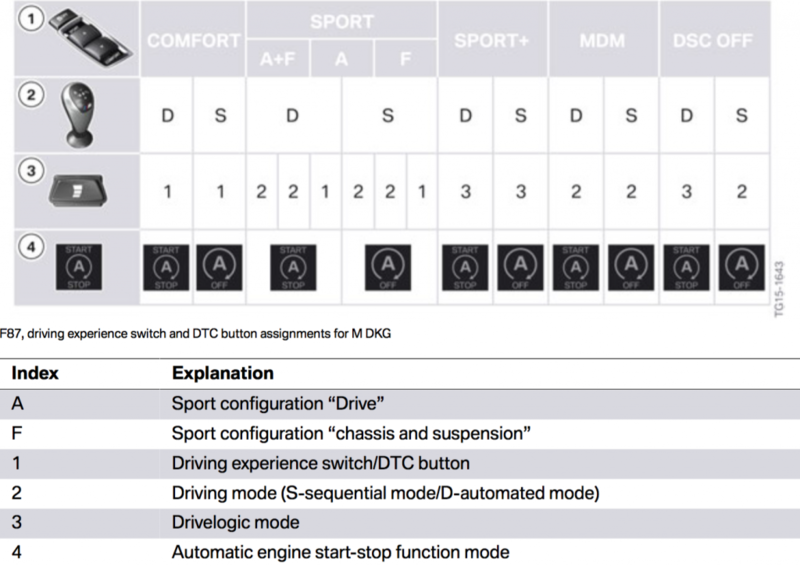 In driving program D with the driving experience switch in SPORT+ position, the gear shifts take place at higher engine speeds and are more dynamic. The automatic engine speed adaptation in the driving program D SPORT+ makes downshifts even more dynamic. In all three modes, the shift points and shift dynamics, among other things, are influenced by the accelerator pedal position: The further the accelerator pedal is pressed down, the later and more dynamic the gear shifts. In sequential mode, the driver determines the shift point. 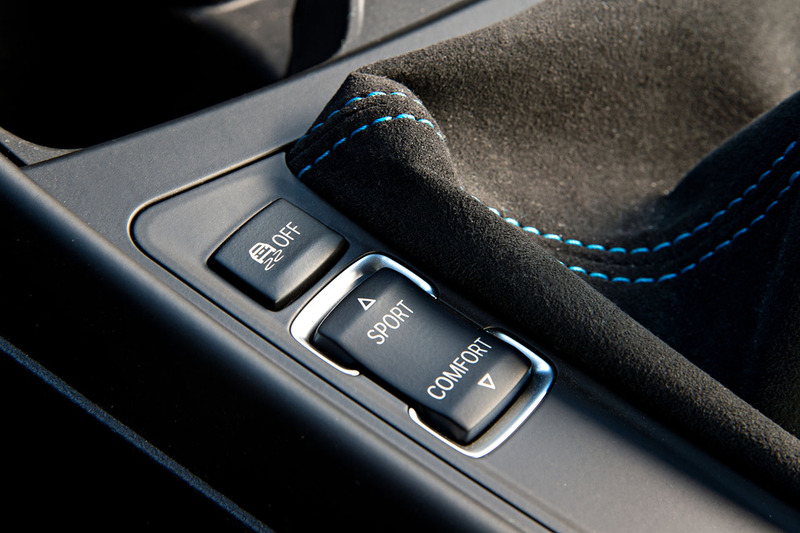 Only the dynamic characteristics of gearshifts are influenced in the driving programs S COMFORT to S SPORT+. Launch Control is a concept that has been around for quite some time. First seen in race cars (F1 for instance), launch control enables optimal acceleration when driving off on a smooth road. During the first 5000 km (3100 miles) the launch control should generally not be used to ensure proper break-in. Automatic deactivation will occur if the driver leaves the accelerator pedal full load range during acceleration or the acceleration phase reaches a duration of 22 s.
If one of these pre-configuration conditions is not met, it is not possible to activate the Launch Control. Also at excessive transmission oil temperature (e.g. repeat Launch Control or race-like start), activation is blocked until temperatures lower. This electronically/electromechanically controlled rear axle differential lock was developed especially for the F10 BMW M5 and is also used in the F80/F82/F83 and in the F87 BMW M2. 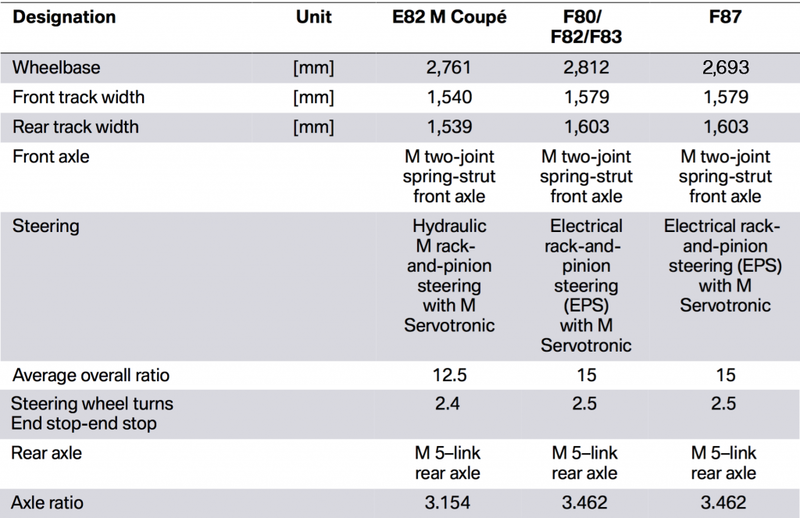 On the F87 BMW M2, the screw connection to the drive shaft is modified in comparison with the F80/F82/F83. It was necessary to adapt this component because a conventional drive shaft is installed in the F87 BMW M2, in contrast to the F80/F82/F83 which have the rather exotic CFRP driveshaft. The gear ratio of the rear axle differential is 3.462:1. 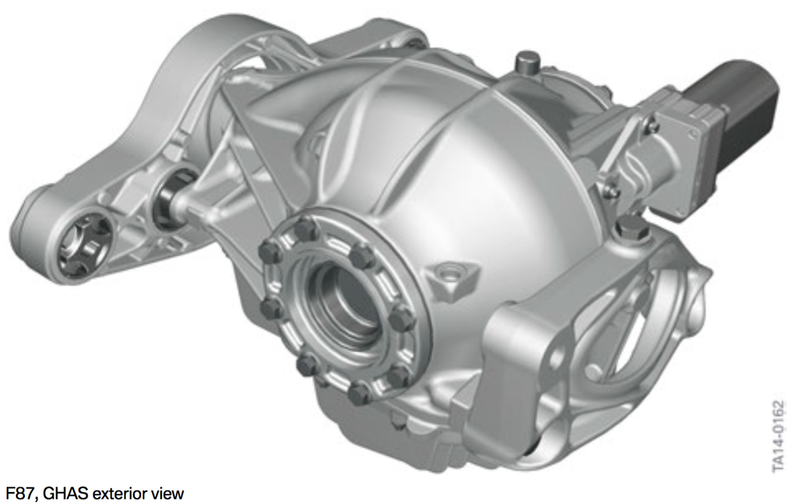 This M rear axle differential II can be identified by an aluminium oil sump mounted from below and an externally visible electric motor. 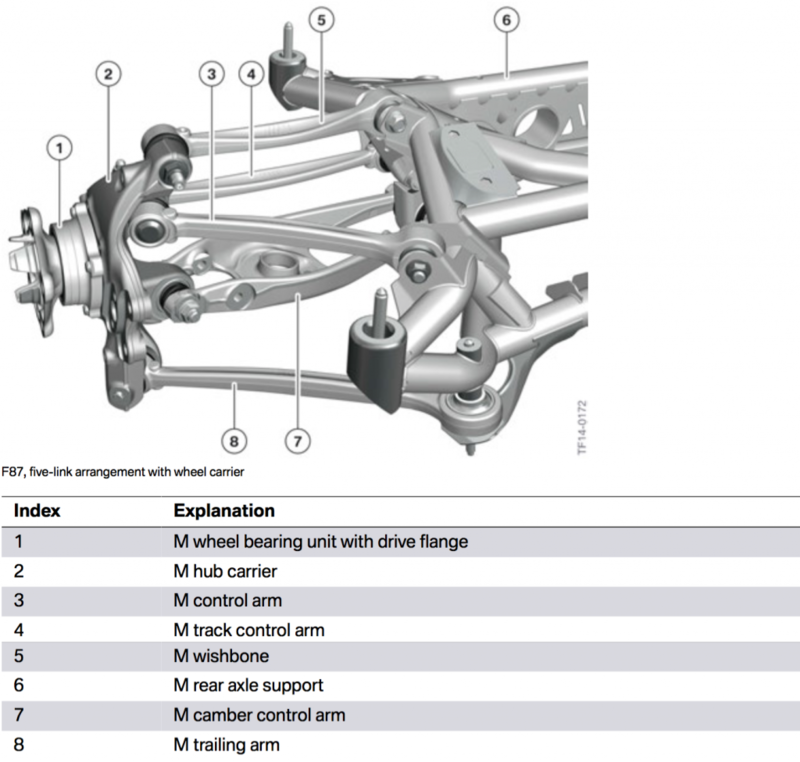 As is typical for BMW M vehicles, the output shafts have a hollow design. In the F87, they transmit a torque of up to 6500 Nm. In the same way as in the F80/F82 and F83, the F87 has hollow-bored trunnion mounts. The wheel flanges is another area where BMWM reduced weight. Less material was used at locations subject to little stress and more material at heavily stressed locations. These measures made it possible to achieve a weight saving of approx. 1.13 kg (2.8 lbs) in the new F87 compared with the E82. As we’ve reported previously on BF, the chassis and suspension are based on the technology of the F80 BMW M3. In many ways the M2 is more of a product of the M4 than a successor to the 1M. In the data above you can clearly see how the rear track and steering ratio in particular are taken directly from the M4. This results in a car with a slightly more relaxed steering ratio and (in our opinion) one that isn’t quite as lively. The upside is that the M2 is a more confident car at the limit and benefits from the improved dynamics of the M4’s suspension. The front axle is based on the M two-joint spring strut front axle of the E9x M3 that’s also found in F80/F82 and F83. All components and bearings are new or adapted for M-specific use. As a typical M feature, the M front axle support is reinforced with a stiffening plate and was largely adopted from F80/F82 and F83. The guide of the wheel for compression and steering is effected by the wishbone, the tension strut, the spring strut and the tie rod. For increased precision the power transmission is effected from the swivel bearing to the front axle guide by ball joints with no play. 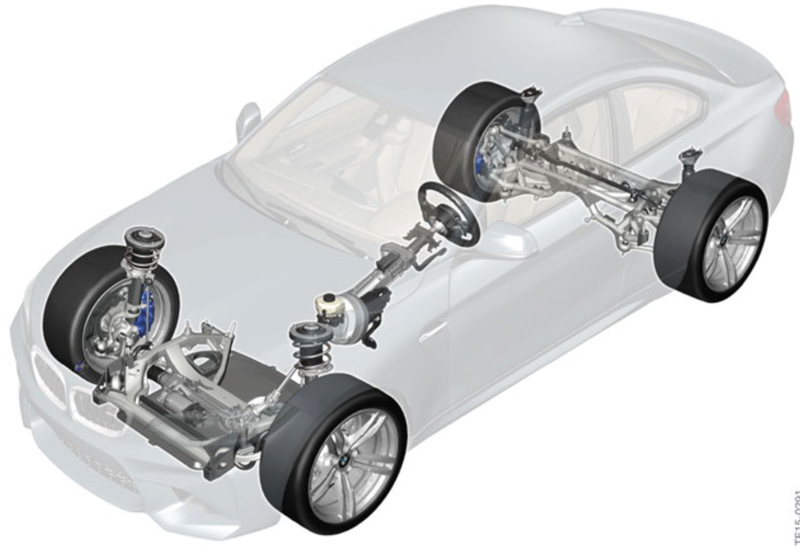 In order to also guarantee this in a longitudinal direction, the chassis and suspension forces are transmitted by specially developed elastomer bearings for the F87 BMW M2 by the tension struts to the front axle support. 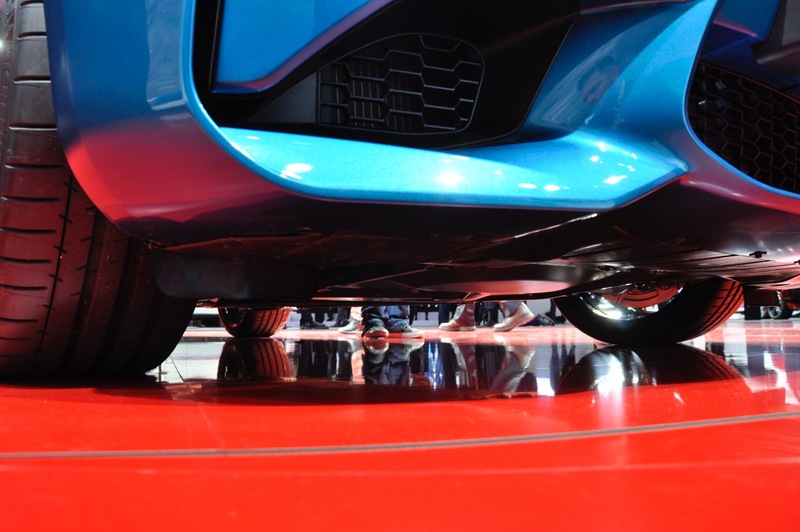 The stiffening plate and the additional screw connections of the axle support and the side sills also ensure an increase in the transverse rigidity of the front of the vehicle by approximately 30 %. The connection between the spring strut and the swivel bearing was achieved by a clamp connection in the same way as on the E82 M and E9x M3, as well as F80/F82 and F83. 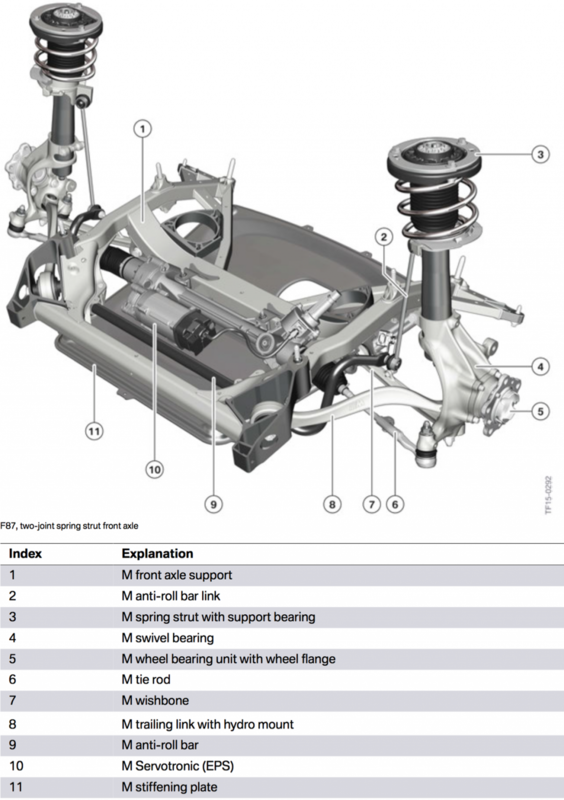 The suspension is one of the key areas that BMWM engineers looked to reduce weight for the M2. 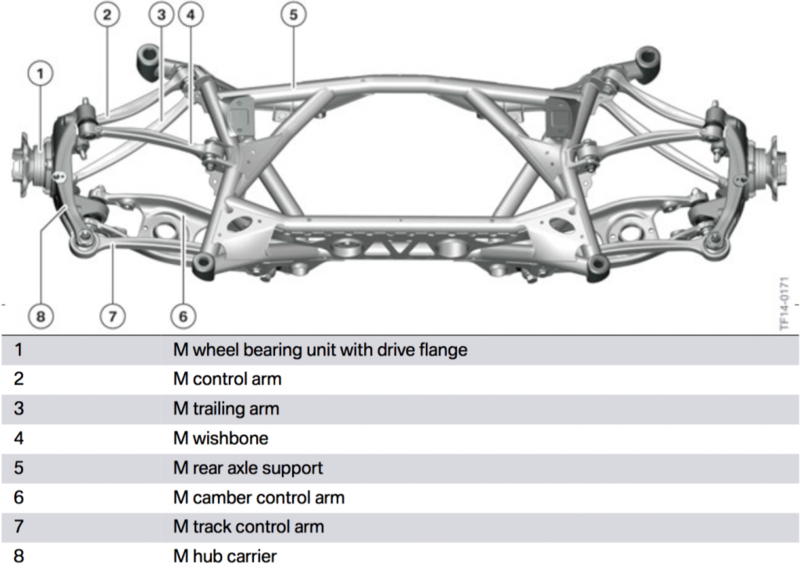 The wishbone, wheel carrier, axle support and the stiffening plate are all manufactured in an aluminum. Further weight savings were achieved with the design of the aluminum spring strut, as well as the tubular design of the anti-roll bar like in the E9x M3. 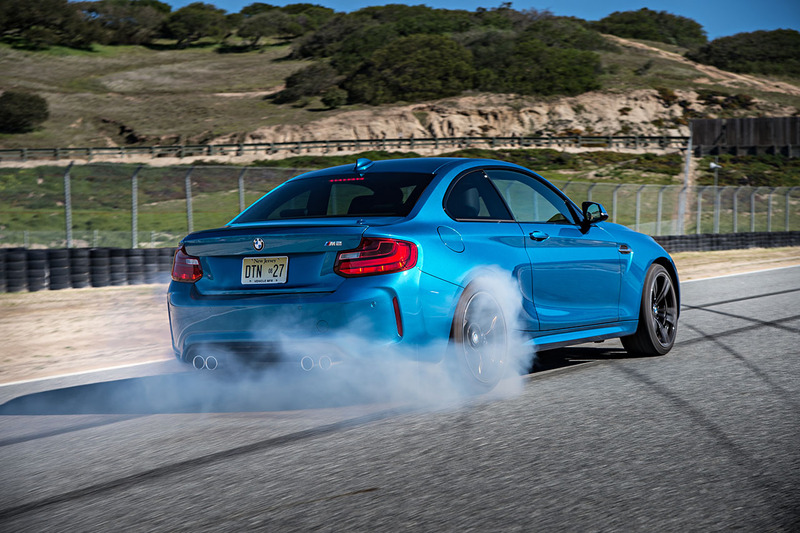 The front axle was specifically designed in conjunction with a new variation of the Michelin Super Sport tires which were created for the F87 BMW M2. 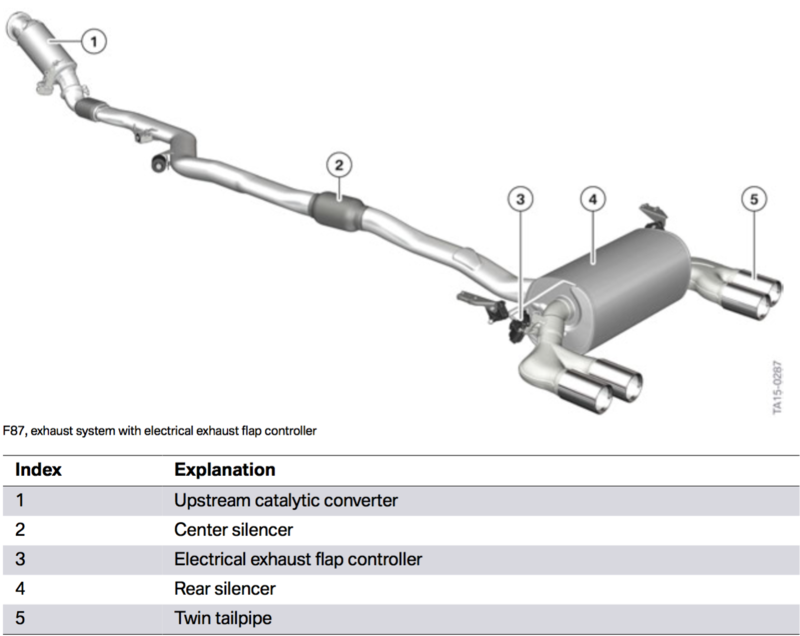 Given BMW’s need to reduce emissions every way it can, the M2 features a rack-and-pinion steering with electrical steering assistance “M Servotronic based on an EPS”. While the system was adopted from the F80/F82 and F83, based on our time with the car, there’s a bit more feedback and transparency than in those cars. While it doesn’t come close to the 1M’s level of feedback or transparency (or any other previous M3) this is likely BMWM’s best EPS system to date. The variable steering gear ratio is implemented through the stroke-dependent gear geometry of the rack. Around the center position of the steering gear, the steering system behaves accurately with steady directional stability. As the steering angle moves away from the center position, the ratio becomes increasingly more direct. The Servotronic function known from conventional hydraulic steering systems is also used in the M Servotronic (EPS) and is installed in the F87 BMW M2 as standard. It is a M Servotronic, which functions according to the same operating principle as in production vehicles. 2 steering characteristics (COMFORT, SPORT) can be selected by a push button operation by the driving experience switch on the center console. How does BMW create feel through data? 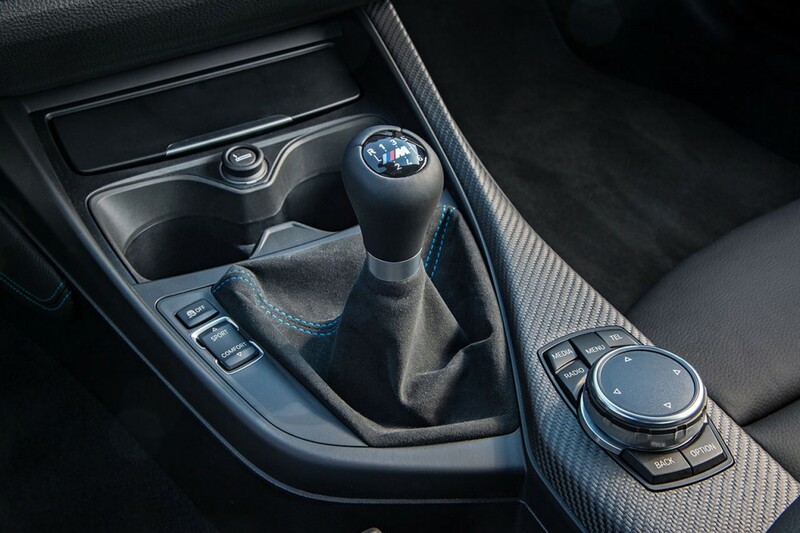 The steering angle information in the F87 BMW M2 is not recorded by the Electronic Power Steering (EPS) and not via a separate sensor on the steering wheel, but is instead calculated back for the steering wheel based on the motor position angle of the EPS motor. Pretty incredible when you consider that everything you feel in your hand is a calculation. 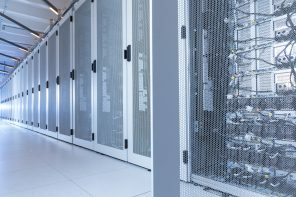 The EPS transmits the position of the rack to the ICM control unit via FlexRay. During this process, the EPS calculates the absolute position of the rack based on the current motor position of the EPS motor and the number of complete revolutions performed by the motor starting from the zero position (straight-ahead driving position). 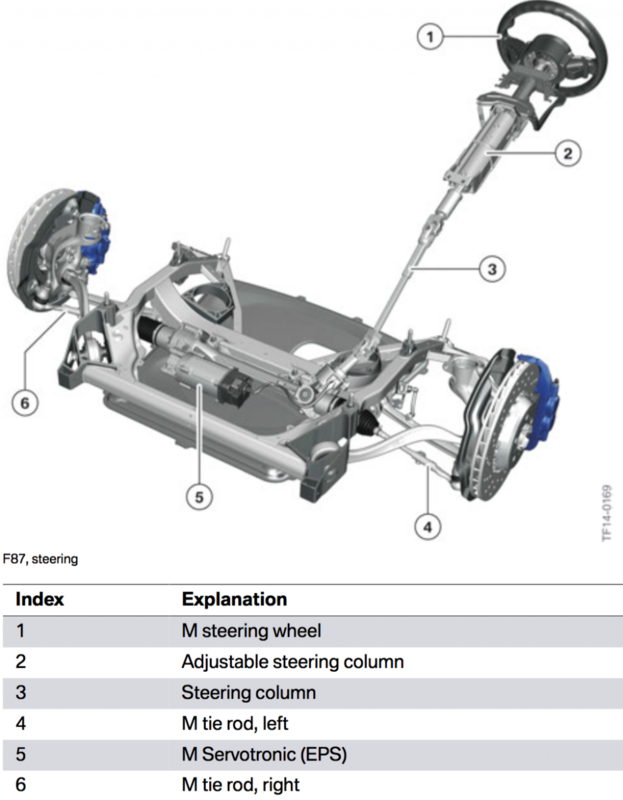 Taking this position as the starting point, the ICM control unit determines the wheel-specific steering angle among other things using the stored ratio parameters (rack to wheel-specific steering angle) and transmits this via FlexRay. This wheel-specific steering angle is used by the DSC among other things as a reference variable for internal control functions. All trailing arms and also the wheel carrier are manufactured in forged aluminum. This reduces the unsprung masses of the components responsible for wheel guidance. 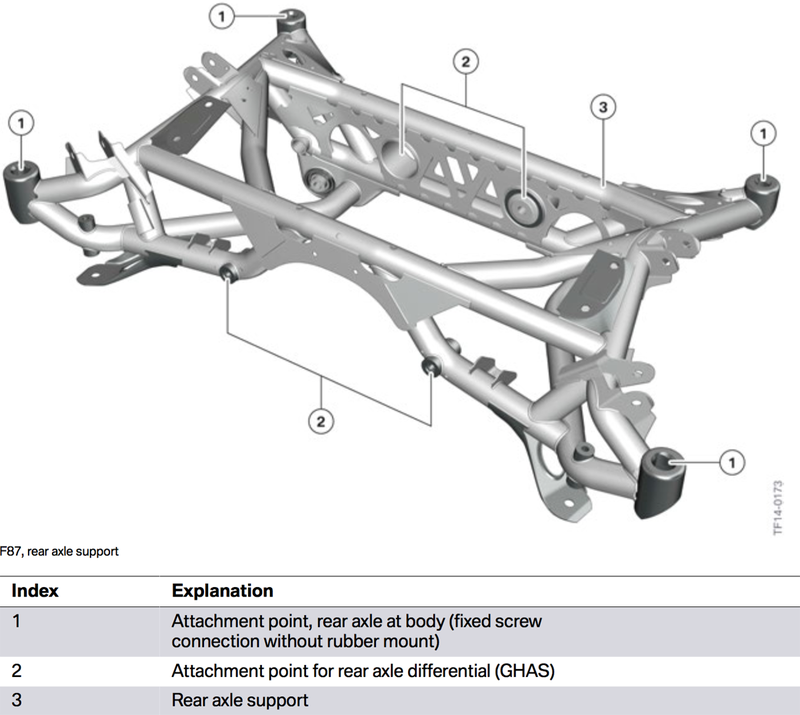 The rear axle support itself is made from steel pipe which is similar to a steel pipe grid frame. This design is characterized by maximum rigidity and minimal weight. Like other recent M cars, the rear axle support is fixed to the body without a bearing. This fixed screw connection directly to the body ensures an optimized wheel guide and thus enhanced directional stability. In addition, through the use of diagonal struts a direct transmission of the longitudinal forces applied during braking to the body structure was achieved. 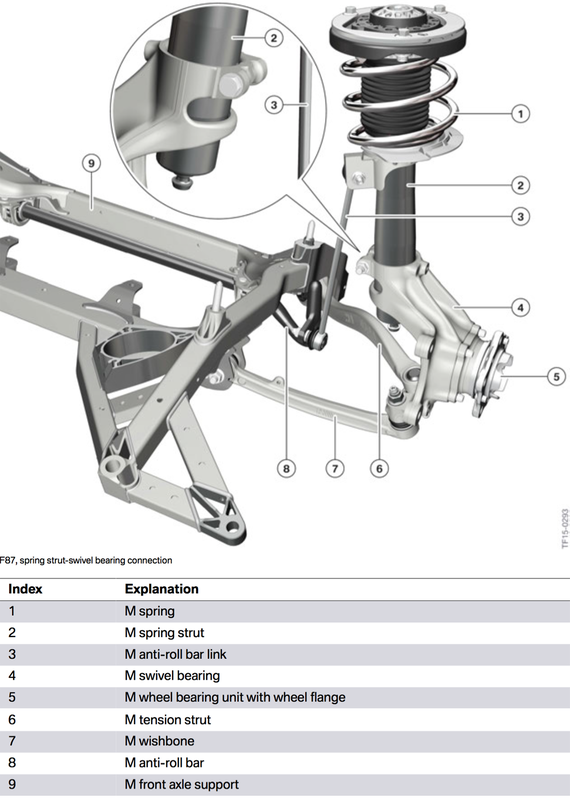 Further weight savings were achieved by designing the spring strut in aluminum, as in the E9x M3. 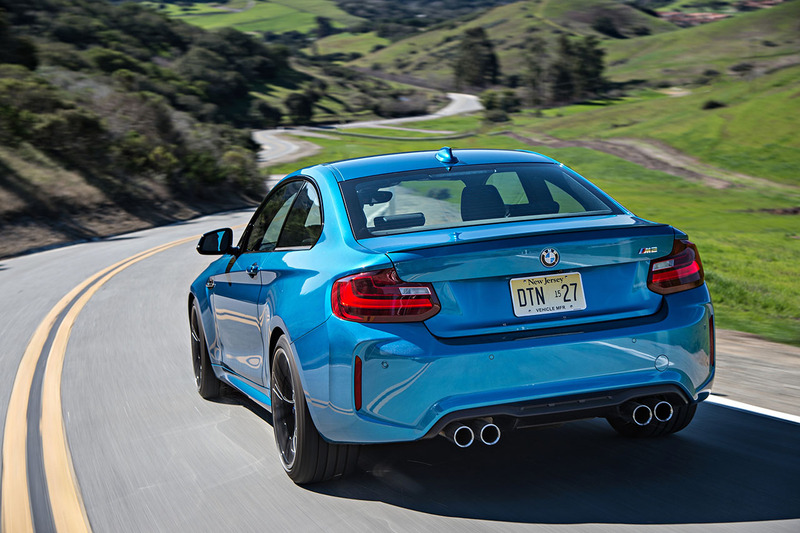 The rear axle was designed particularly taking into account the new Michelin Super Sports, which again were newly developed for the F87 BMW M2. 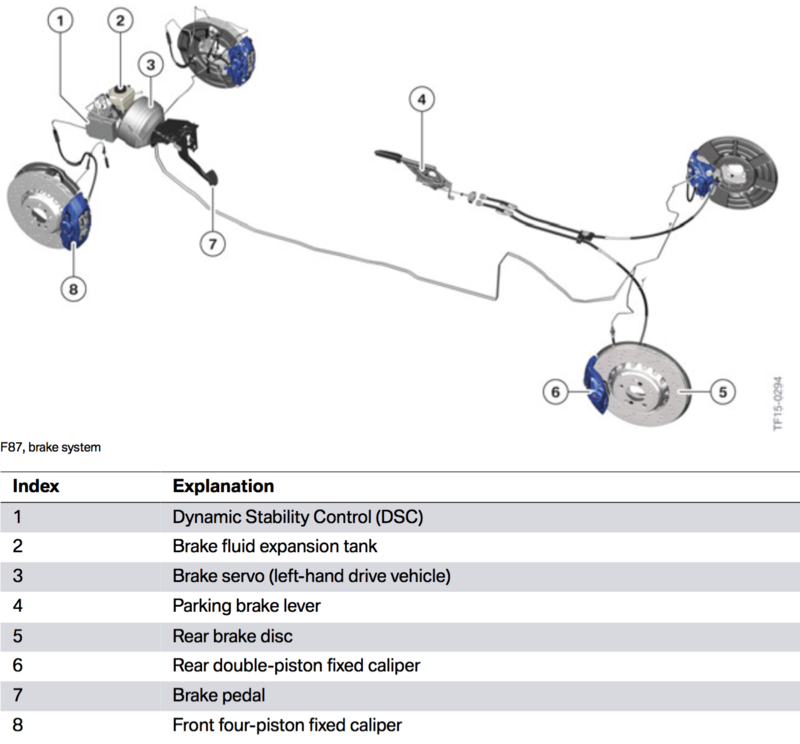 The brake system of the F87 BMW M2 is largely based on the M compound brake from the F80/F82 and F83 (the exception being the parking brake cable). The front brake has been adopted completely from the F80/F82 and F83. It is a large perforated M compound brake disc combined with a four-piston fixed caliper. All brake calipers are the now traditional M blue with a colored M logo regardless of the exterior vehicle color. The rear brake has also been adopted completely from the F80/F82 and F83 and is a double-piston fixed caliper. The M-specific setup of the driving dynamics (longitudinal and transverse) took place, among other things, on the Nordschleife of the Nürburgring. The main criteria according to BMWM were handling and the lap times. 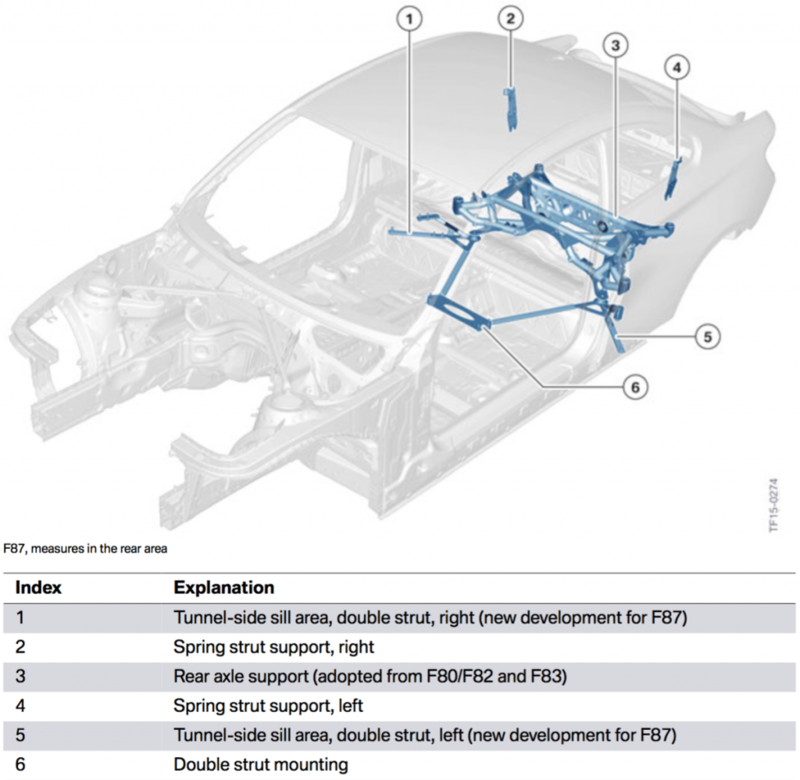 Integrated Chassis Management (ICM) is the transverse dynamics system network. 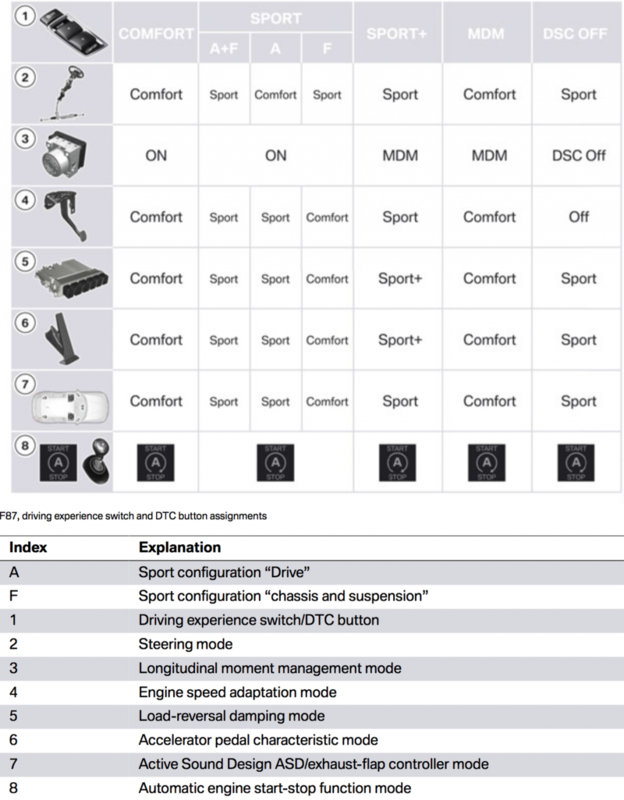 This control unit coordinates the interaction between the M Servotronic (EPS), DSC, engine control, M DKG and the regulated rear axle differential lock (GHAS). 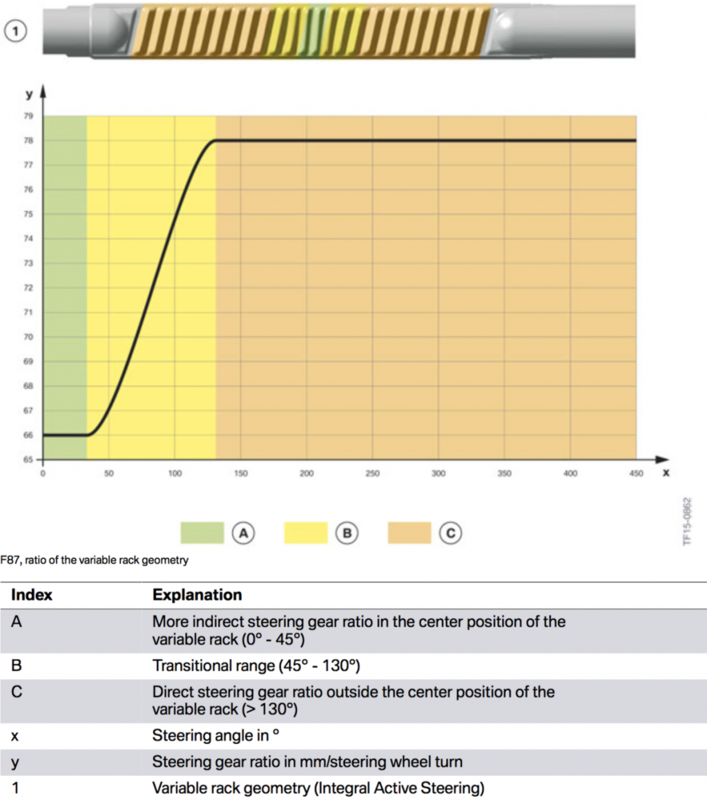 Longitudinal dynamics management is performed by the Dynamic Stability Control DSC. The Dynamic Stability Control DSC MK 100 (designed and built by the automotive supplier Continental) is used in the F87. In M Dynamic Mode (MDM) the control threshold of the brake interventions is expanded/raised and the engine power reduction by ASC is applied significantly later. This enables slight wheel spin and even drifts in certain situations. In our time at the track the thresholds seem similar to the new M3/M4 and a little less aggressive than in the 1M. The driving experience switch has 3 modes. With the M double-clutch transmission, the following modes are additionally influenced by the driving experience switch and the DTC button. And yes, in case you were wondering the M2 does indeed have Active Sound which transmits synthesized engine sound into the cabin. For further info on active sound check out our previous look at the technology. 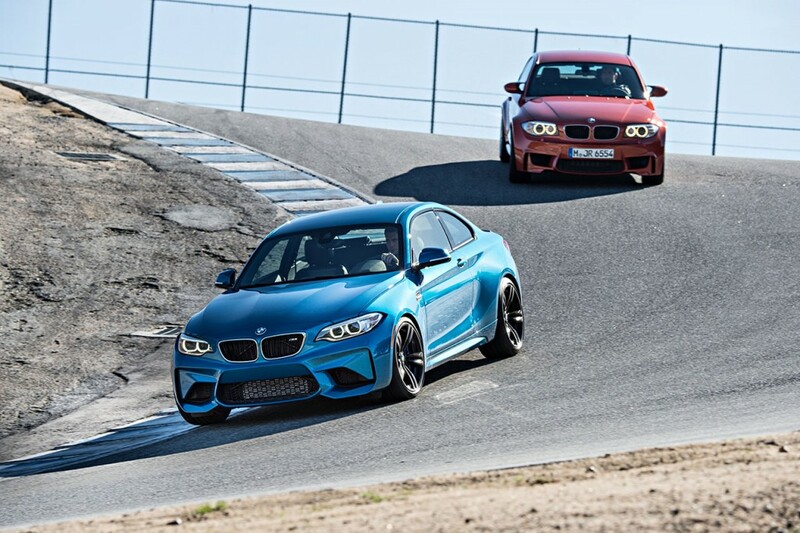 The BMW M2 is slightly more of a baby M4 than a follow-up to the 1M. Its increased rear track width, higher steering ratio and EPS system gives the car a a little less on-edge/raw feel. Furthermore the longer wheel base and increased weight (154 lbs) means that the M2 doesn’t feel quite as nimble as the 1M. Yet the performance on the road has been improved with more confidence at the limit, higher engine performance and a much improved grip threshold. And on the track, the M2 is almost on another planet in terms of lap times. Perhaps best of all this is a car that comes fairly loaded for the price of a E46 M3 when new. And that’s with substantially more performance, higher fuel economy and many more technology and convenience features. As we said in our initial review of the M2, it feels more like a follow-up to the E46 M3 in size and overall attitude than a successor to the 1M. And considering how revered that car has become, that is a very good thing. Extremly good looking car and sportly, the best for me is the exhaust´s sound in sport+ and in high revolutions.